Well, as any of my college friends who read this blog would know, I was a gigantic follower of the Dave Matthews Band at one point, so this death feels really bad to me...his work was AMAZING. I'm still reeling from "Before These Crowded Streets," ten years later. He died yesterday afternoon at the young age of 46 from complications from his injuries he had sustained during an ATV accident. WOW. There will never be an original DMB again, and the world has lost an amazing talent. 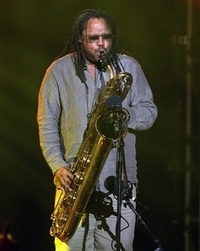 I will just quote Dave on this one: "Our good friend LeRoi Moore passed on and gave his ghost up today and we will miss him forever." Either way, warning - this is hysterical, but its also EXPLICIT, and it is NOT safe to watch in most workplaces. Sorry for the OT post, but enjoy. PS- If you want to see the video better - click here! Enjoy, this man is AMAZING, YEAH!!! Or if you can't see the player, click here.